You're no doubt familiar with Grumpy Cat; Tardar Sauce, the unfortunately featured feline whose underbite and dwarfism propelled it to the heights of internet fame. Perpetually pissed Tardar now has an empire of books, apps, a film, merchandise - anything you can stick its little grumpy face on. It's got a brand image that needs protecting, hence why Tardar (okay, Tardar's owner) is suing Los Angeles-based coffee group Grenade Beverage for $1.8 million. 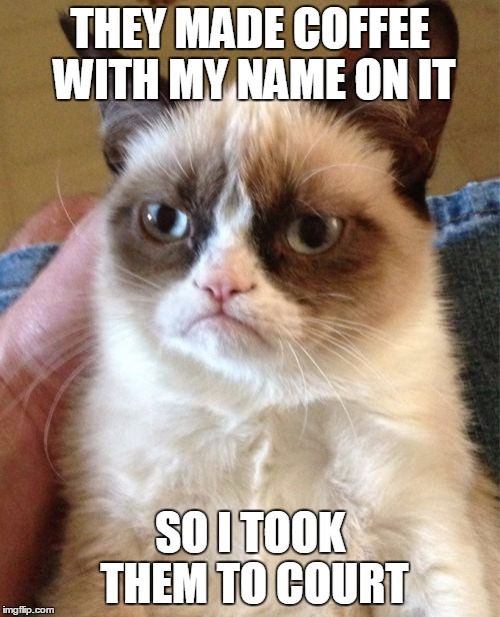 Grumpy Cat Limited (yep, the cat has its own company. How unsuccessful do you feel right now?) filed a lawsuit back in December claiming that Grenade Beverage had overstepped the boundaries of contract that would allow the coffee company to make a line of iced-coffees with Tardar's face on the packaging. "The mutually understood intent of the License Agreement was to allow Grenade to produce and distribute a line of 'Grumpy Cat' branded iced-coffee beverages called 'Grumpy Cat Grumppuccino,'" states the original complaint, probably making the day of whichever court had to process the paperwork. "The parties further understood and agreed, as clearly memorialized in the language of the License Agreement, that any additional product offerings would require further negotiations and approval from Plaintiff." Things got catty when Grenade started selling Grump Cat branded roasted coffee, which Tardar's owners see as trademark infringement and breach of their contract. Grenade has retorted with its own claim, stating that "Grumpy Cat Ltd. is liable for breach of contract, breach of the covenant of good faith and fair dealing, intentional misrepresentation and/or concealment and reverse domain hijacking." It's expected that the counter claims will drag the court case on longer. It's a proper cat fight.